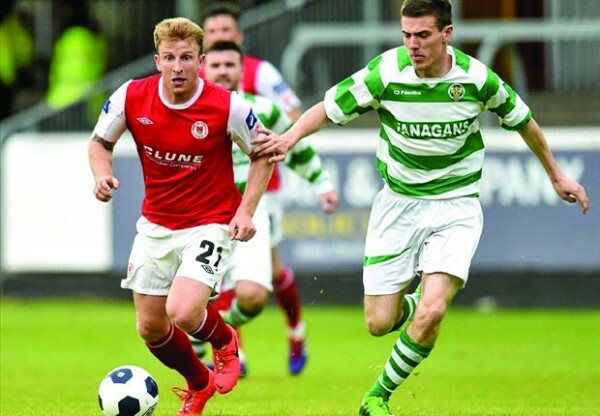 CY’s Lee Joyce in action against St Patrick’s Athletic. St Patrick’s CY embark on another season of Intermediate football for the 2014/15 Leinster Senior league campaign! In our last update I was happy to report that our Senior side was safe from any thoughts of relegation, a scenario that had loomed heavily over the club for much of last season. Unfortunately, our Saturday side wasn’t so lucky, but will still compete at a very high level in the Major1 division. At that point we had three league matches still to play, while also looking forward to a glamour FAI cup 2nd round tie with St Patrick’s Athletic. The club finished in a very credible sixth place in the Senior division. Those final three games served as ideal preparation for the monumental task of taking on the League of Ireland champions at their Richmond Park home. CY were drawn out of the hat first but it made more sense from a financial and logistical point of view to switch the contest to the Inchicore venue. The game itself took place on Friday June 6th and attracted a decent attendance of around 800 spectators, with a sizable contingent from Ringsend. Our players put up a brave display, keeping the game scoreless until just before half time when the Inchicore saints broke the deadlock and CY hearts with a well-worked opening goal scored by Conan Byrne. Former Irish international Keith Fahey doubled their lead soon after the break to effectively end the tie as a contest and Liam Buckley’s side added a third on 75 minutes through Daryl Kavanagh. The league champions could have added another goal or two as our amateur players began to feel the pace, but man of the match between the sticks for CY, Darren McGarry, made a string of fine saves to keep Pat’s out. It was a great night for the club overall and we will be hoping to reach this stage again for the fourth year running in 2014/15. So to the new season. Pre-season has gone very well with many additions to both our Senior and Saturday squads. In particular, we have recruited a number of players from last season’s Cambridge Boys U18 team, injecting some youth into the Saturday set-up, an important project to harness the next batch of senior players. The senior squad has also been bolstered while retaining all of last season’s players, with the exception of goalkeeper McGarry, who has joined Dundalk FC. Pre-season games went well and the welcome return of the Noel Fox tournament gave the management the opportunity to look at many of our new recruits in a semi-competitive match again Liffey Wanderers. The new season kicked off for our Senior side on September 15th. A 2-1 victory was secured thanks to a double from last season’s top scorer and player of the year Thomas Dunne, the second of which was a spectacular over-head kick. This was followed up with a 2-0 away win over current champions Crumlin Utd; Paul Healy and Gary O’Connor with the all-important goals. So a good start, but a long way to go for the new season. Finally, the committee at CY would like to wish the management team of Derek Bowden, Ed Saul, Paul Andrews and Alan Murphy the very best for the new season as they oversee both sides. We would also like to thank our many sponsors, in particular our main partner Fanagan’s and new supporter The Irishtown House.